A British petition to cancel Brexit and remain in the European Union is drawing too much support for the U.K. government's website to handle, with the petition site crashing repeatedly on Thursday. More than 1 million people have signed the petition to revoke the triggering of Article 50 — blowing past the 100,000 signatures needed to compel a debate in Parliament. The article is the EU treaty's exit clause. The petition drive comes as Britain's government has gone through contortions trying to set terms for leaving the EU — but Parliament and Prime Minister Theresa May have been unable to agree on how to do so. This week, the repeated delays forced May to ask the European Council to extend the Article 50 period through June 30, rather than the March 29 deadline. "The government repeatedly claims exiting the EU is 'the will of the people'. We need to put a stop to this claim by proving the strength of public support now, for remaining in the EU. A People's Vote may not happen - so vote now." The petition was started last month by Margaret Anne Georgiadou, who said via Twitter a week ago, "I simply want a large number to slap in the government's face." She has that large number now, after support for the petition exploded this week. The anti-Brexit petition went up "like a rocket" on Wednesday, Georgiadou said when it was around 200,000 signatures. The drive kept its momentum Thursday — when, that is, the site was available to people who wanted to add their signatures. "The rate of signing is the highest the site has ever had to deal with," the House of Commons' Petitions Committee said, "and we have had to make some changes to ensure the site remains stable and open for signatures and new petitions. Thanks for bearing with us." The committee said up to 100,000 people were viewing the petition at the same time Thursday, adding, "Nearly 2,000 signatures are being completed every minute." The petition brought praise for Georgiadou on Twitter, where she's being called a national treasure. In one popular comment, a fan wrote, "Your petition has been a tonic, thank you." With the website suffering difficulties, and backers of the petition not wanting their curiosity to prevent anyone else from signing, the movement produced an unlikely star: a bot on Twitter named UltraButt, which initially existed as a joke account but was repurposed to track the numbers in the most serious issue facing Britain today. "I'm out of my depth," the account's owner wrote. "This morning I was a bot with 15 followers that reposted poo and wee jokes out of an IRC [Internet Relay Chat] channel." By posting steady updates on the petition figures, the account quickly reeled in more than 7,000 followers. "The horrifying feeling you get when your friend's d*** joke bot is turned into a petition tracker and it gains 3000 followers in a few hours," Charlotte Gore wrote (she did not use asterisks). "And that's British politics in 2019," Caitlin Moran replied to Gore — who also acknowledged that the bot had surpassed her own Twitter presence. With a nod to its heritage, the bot refers to the petition's signatories as "mofos." It also advises, "Don't click the link to the petition unless you haven't signed it!" 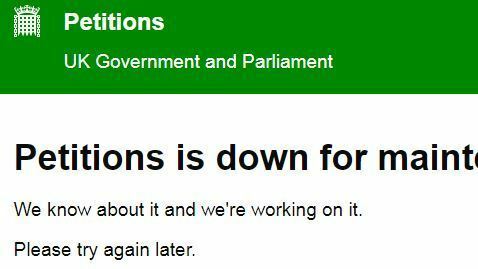 Other posts simply state, "The petition site is knackered." It's not likely that the online petition will cause Prime Minister May, opposition leader Jeremy Corbyn and others at the heart of the Brexit debate to simply pull the plug on a process that has now been in the works for more than two years. But it's a reminder of how deep the divide is over leaving the EU, and how close the Brexit vote was in 2016, when 17.4 million people in the U.K. voted to leave and 16.1 million voted to stay. The new petition also paints a map of where the "remain" sentiment runs strong in the U.K., with areas such as London, Cambridge and Manchester showing the most support, along with Glasgow and Edinburgh in Scotland. More than 17,000 of those who signed the petition said they're U.K. citizens living overseas, including more than 8,500 people in France, 4,700 in Spain and 3,700 in Germany, according to data from the petition site. Support for the petition is far greater than for a similar call made in early February, when 135,00 people signed a petition to revoke Article 50 if Parliament didn't agree to a Brexit plan by Feb. 25. In response to that earlier signature drive, the House of Commons' Petitions Committee held a debate on March 11. "One of the things I wanted to use this debate for was to remind people that the 48 percent feel strongly too," said MP Daniel Zeichner of Cambridge, when he raised the subject for debate. May set the Brexit timeline in motion in March of 2017, when she officially invoked Article 50. She reached a draft withdrawal deal with the EU in November, but Parliament has repeatedly rejected her plans. The delays have increased the possibility that the U.K. could leave the EU without a deal; they've also driven public frustration and talk of a potential new Brexit vote. During last week's debate on the previous petition, Zeichner said that in his view, the question of leaving the EU should be put back before the public for a new vote.